Annapolis FPGA boards are engineered for superior performance and maximum bandwidth. 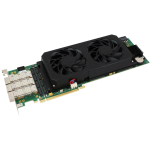 Both Intel and Xilinx PCIe FPGAs are leveraged to offer the best PCI Express data acquisition and processing cards possible and to fit customer preference, design requirements, and production schedule. 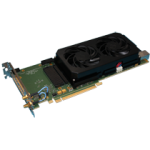 WILDSTAR™ Ultra, WILDSTAR A5 and and WILDSTAR 7 PCI Express FPGA data acquisition boards provide PCIe Gen3 8x Connections from each FPGA to an on-board PCIe switch which can support up to a 16x Gen3 motherboard connection. They accept standard Annapolis WILDSTAR mezzanine boards and may be optionally populated with three front panel QSFP+ transceivers. Each QSFP transceivers supports four lanes with line rates up to 14.1 Gbps which covers such protocols as 10GbE, 40GbE, QDR Infiniband, OTU3 and OC-768. WILDSTAR 6 FPGA boards support up to an 8x Gen2 interface. Up to two identical Xilinx® Kintex or Virtex UltraScale FPGAs with choice of Kintex™ UltraScale KU085 or KU115 or Virtex™ UltraScale VU125 FPGAs. Up to 80 GB of DDR4 DRAM for up to 116 GB/s of DRAM bandwidth. Up to 2.5 million logic cells and 5.4 million multiplier bits per board. Up to three Intel Stratix® V FPGAs per board with choice of GX parts up to 5SGXAB or GS parts up to 5SGSD8, up to 192 MB of QDRII+ SRAM for 118 GB/s of SRAM bandwidth and up to 16 GB of DDR3 DRAM for 128 GB/s of DRAM bandwidth. Up to 2.8 million logic elements and 4.3 million multiplier bits per board. Up to three Xilinx Virtex 6 FPGAs per board with FPGA sizes up to LX550T or SX475T. They are available with up to 7 GBytes DDR2 DRAM for 22.4 GB/s and up to 448 MBytes DDRII+ or QDRII SRAM for 25.2 GB/s. Up to 1.6 million logic cells and 2.7 million multiplier bits per board.